Almost everyone wears jeans. Now that I've 'retired' a bit from the biz world, I find myself in them more than ever. The issue (for women) with finding the right pair always ends up as a struggle between being on trend and finding a flattering fit that's comfortable. Easier said than done. I've purchased expensive designer brands for years. With most, it seems there's one thing I don't particularly like. Too short/long, a bit snug in the legs on skinny's or too wide in the thigh with flare/bootcut styles. You name it, I've spent money on jeans I rarely wear. Beija Flor has my attention for fit, but also for their commitment to the environment. A chance meeting in a blowout salon when my husband was playing in Greenville, SC a little over a month ago changed all of that. I met Emilie - co-founder of Beija Flor jeans (her partner is her mom). She lives and operates a denim salon in the quaint little town although the brand is global. Native Brazilian roots are the reason that designs are made for women with curves and why Beija Flor has receieved rave reviews. 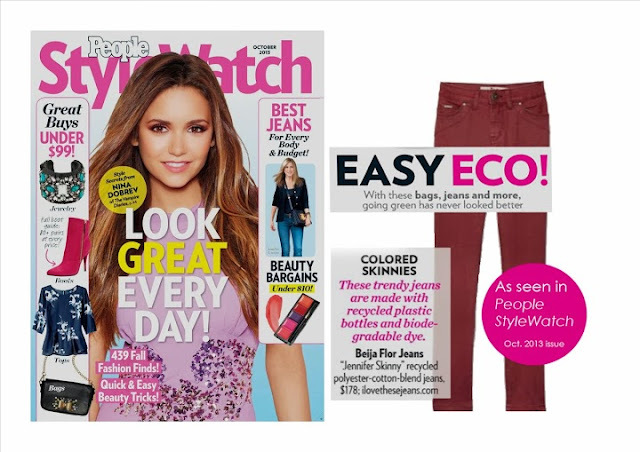 Oprah's team named them 'the best jeans in the world' and People Style Watch described them as 'life changing'. The fit and feel is so spot-on, I'm stocking up. I'm just sorry that I missed all of the press and wasted time buying other designs before this discovery. Now I'm totally hooked. The bonus to a great fit is that every pair is ECO FRIENDLY and made from totally recycled products. I went to her store the day after we met and snapped up two pair (and have ordered more online). My choice of the moment is the Kelly Pod skinny in midnight blue/black-- zero hardware to deal with. No zippers or buttons, but they fit like a glove. I've been washing/drying them with ease. The feel is similar to leggings but the look and fabric completely designer jean. Since the philosophy is all about serving shapely women, all sizes work. Right now, Beija Flor is being sold at 300+ retail locations across the country. In Nashville you can only find select styles at Two Old Hippies or The French Shoppe. I'm betting more stores get in this game, as the new offerings will have a cult following! Until then, you can always get them straight from Emilie online. And yes, bending and snapping is a breeze in these.